The Events Template needs to use 1 page inside of the Pages Module (CONTENT > Pages) to work. Simply assign the Events Template to a page in the TEMPLATE field inside of the page editor for your events to show up on your website. Events: This is a list of all the events with some basic information. Events can be organized by Event, Start Date, and Status. Calendar: This is a calendar view of all of your events. This view is where you can edit specific occurrences (for example: cancel youth group for one night). RSVPS: This gives you a list of all the RSVPS for your events and can be organized by name, event, email, guests, or RSVP date. A member of the Ekklesia 360 team will need to enable this for you if you wish to use the RSVP functionality. Categories: As an event is created, it can be put into any category. This is useful to organize events and can be managed on this page. It also makes it easier for the site user to find the event they are looking for. Coordinators: This lists the event coordinators and how many events they are coordinating. You can also link a Coordinator to the person's corresponding Member profile if you wish to do so. Edit Selected Events: This allows you to edit or delete any selected event. This is a way to edit/delete events in bulk. Add A New Event: Allows you to add a new event. All event images should be a 16:9 ratio (1,024px by 576px is the recommended size). 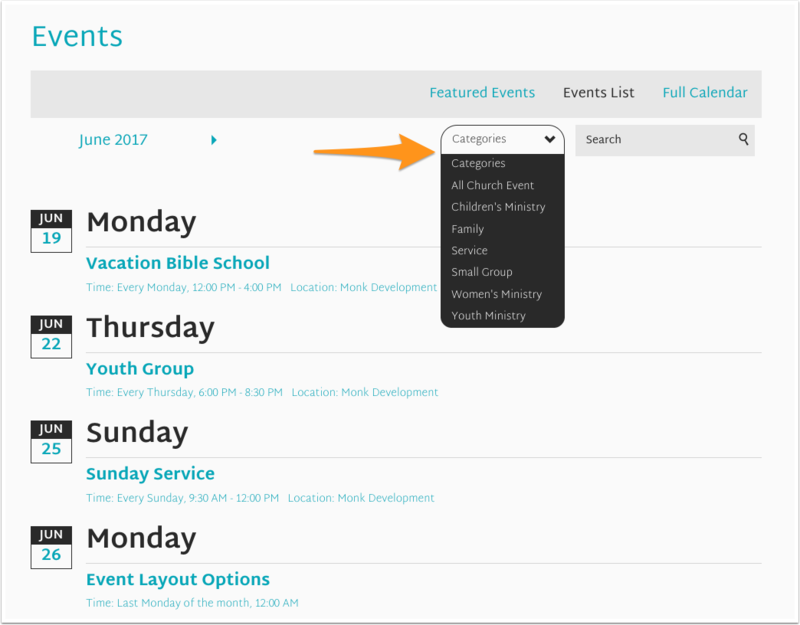 Once your events are created and organized, the congregation can view your events by visiting the events page (normally found in your site's navigation). The default view for the Events page is to display the Events that are "Published As Featured". It is important that you select good quality photos for the featured events for this page to look as nice as possible. There is also an Events List view option. The events will be listed in order of date and the user can click through to see coming months. The user may sort the events using the categories drop down or search for a particular event. The last event view is the Full Calendar. 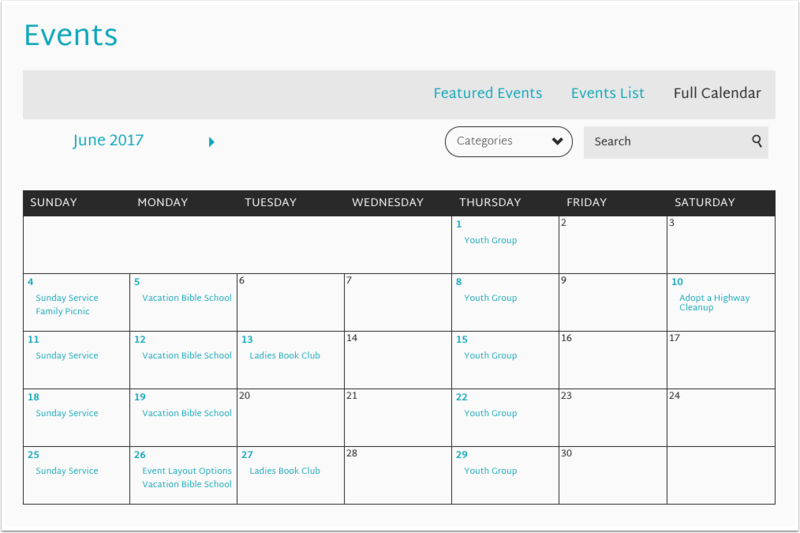 This is a good way to get an overview of the month for the church and members can click on an event to get more details. 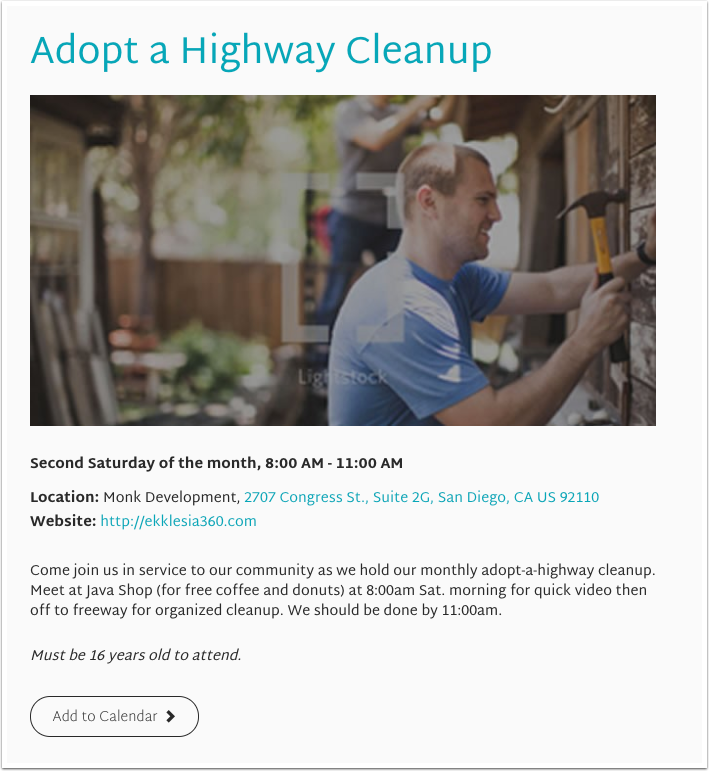 ***NOTE: The Full Calendar view is hidden from users when the site is being viewed on Mobile devices and some Tablets. This is due to the fact that calendar girds are very hard to use when viewing the site on such a small screen. All the information is still accessible through the Event List View. When an event is clicked on from any of the 3 views, it will show all the information available for the event. If a field within the event editor is not filled out, it will simply not show anything, rather than leaving an obvious blank space. 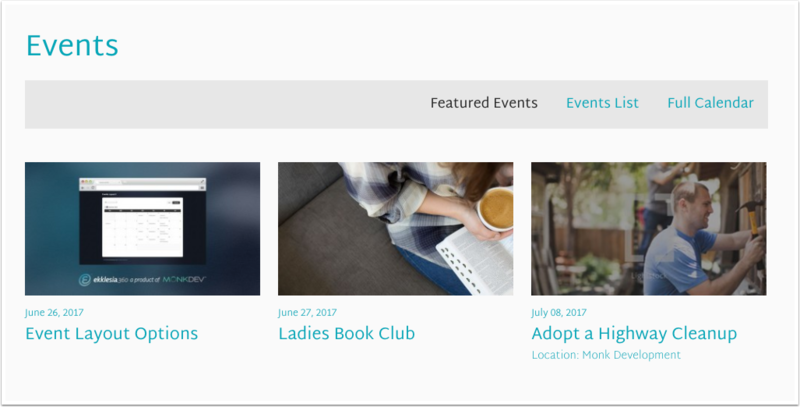 The Event Details page will also show buttons to RSVP (if applicable) and a button add the event to their personal calendar.